Every staircase designed by Geoffrey Bawa is unique says David Robson, the leading expert on Sri Lanka's best-known architect. In a Dezeen exclusive, he picks out the 10 that are most worth knowing. The late Bawa was one of the driving forces behind the style of architecture known as tropical modernism, combining his education in the UK with the traditions of his home country. From the 1950s up until his death in 2003, he completed over 100 buildings in Sri Lanka, as well as a handful in other countries including India and Indonesia. "Bawa's approach could be characterised as a search for the new and the authentic informed by lessons from the past," said Robson. "His was an architecture of place which responded to the physical and the cultural context." "He used traditional materials and construction methods to create spaces that were of their time and place," he added. A friend of the architect, Robson wrote the monograph Bawa: The Complete Works, published in 2002, and also curated a retrospective exhibition at the Deutches Architektur Museum in Frankfurt in 2004. His latest project is a book focusing specifically on Bawa's staircase designs. Published by Laurence King and featuring photography by Sebastian Posingis, Bawa Staircases aims to reveal the "rich diversity" across the architect's portfolio. "Every design was unique and he never repeated himself," explained Robson. Bawa was aiming to create "a tropical version of an Italian renaissance garden" at Lunuganga, the estate he built over a 50-year period on a former rubber plantation. There are around 30 staircases dotted around the garden, including this one between the arrival court and the south terrace. Terracotta tiles form the treads of this spiral staircase that winds up through the centre of a house Bawa designed for a doctor and his musician wife. A curving handrail from hardwood creates a smooth curve at the centre of the staircase, although the stairwell itself is square in plan. Cast concrete was used to create the two curvaceous, spiralling staircases at this school. Originally the concrete was left exposed and decorated with murals, but they were later coloured with gloss paint. Today, only half of the school still stands. This towering structure was a pavilion that Bawa designed for an industrial exhibition in 1965. Rising 40 metres above the ground, the tower consisted of two intertwined staircases and three viewing platforms, supported by a steel framework. According to Robson, it is loosely inspired by the unbuilt Tatlin's Tower. Robson describes this hotel as "combining the ambience of a medieval manor house with the functions of a modern tourist hotel". 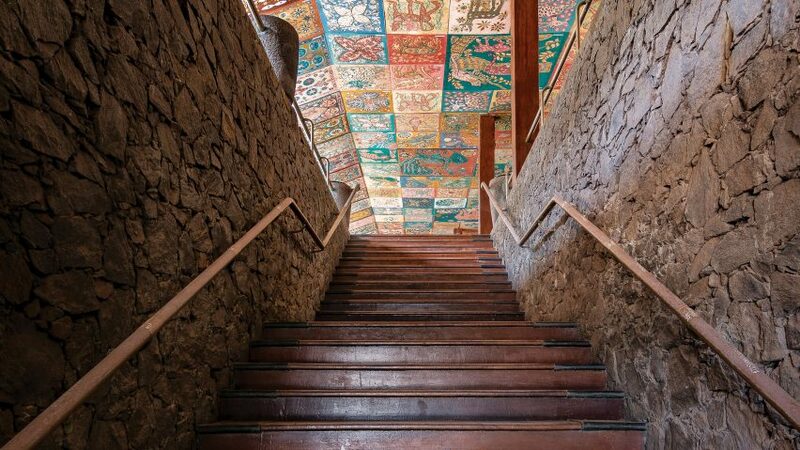 Guests enter via a wooden staircase, which leads up from a dark reception into hall boasting decorative batik panels. Bawa combined four tiny cottages to create this residence for himself in the 1960s. He replaced one of the four with a modernist three-storey block, giving the building a tower at one end. The storeys are connected by a dog-leg stair that Robson describes as "reminiscent of the curving staircses of Francesco Borromini and Balthasar Neumann". Bawa created this unusual staircase as part of the renovation of a dilapidated property bought by his friend Lidia Duchini. It ascends in stages, starting with a three-stepped plinth. These continue into three steep flights, all pointing in different angles and divided by square landings. This staircase is located inside one of the 50 buildings designed by Bawa for the 50,000-square-metre university campus. Located in the arts complex, it has a bench seat built beneath its half-landing. Robson describes it as "a popular meeting place for lovers". Nestled between a cliff and a reservoir, this six-storey hotel is wrapped in plants. Its various staircases include one that links the reception level with the dining area, above which hangs an owl sculpture by artist Laki Senanayake. Completed just a fear years before his death, the Lighthouse Hotel centres around a spiral staircase designed in collaboration with Laki Senanayake. Decorating its balustrades are metal sculptures of warriors from a 17th century battle. The entire space is set beneath a domed skylight, which "produces a shaft of light that tracks around the wall of the drum as the day progresses".